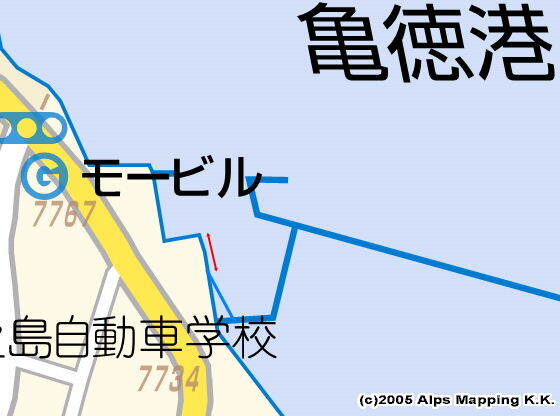 Berth: Once you enter the port, you will see a slope on your right. The left side of the slope is the berth space. Local people say it is always open for visitors. Two sail boats can be moored alongside. As it is close to the port entrance, you will be affected by inbound waves though. Most of the boats in this new port look recreational fishing boats. I walked to see the old port. There is some berth space though, it is shallow, local people say. 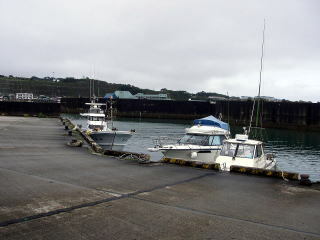 When I visited again in April 23, 2007, the above visitor space was filled with fishing boats. 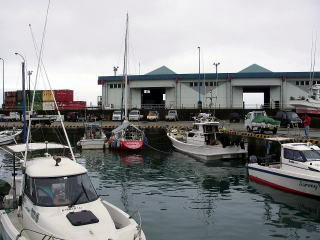 Then, when I was looking around slowly in the port, a man on the land directed me another berth space. 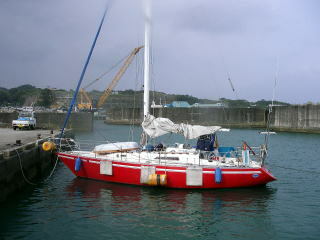 He says OK to tie up alongside to an always-mooring small fishing boat, which is close to the corner in the inner area. Water can be supplied with the company at the ferry. Or, there is a tap with a key at the near park. Toilet is at the ferry landing place, which is closed at night. Coin laundry is 7 minutes away. There are A-COOP supermarket and many others for shopping. There are many gas stations for the fuel. There is a sauna bath 10 minutes away, people say. I’ve never been there yet. There are many small restaurants. as a good restaurant for sashimi plates, or sliced raw fish. You might think you will be getting palled with good sashimi plates when you are hoppling islands. But, it was first time for me to enjoy local fishes sashimi plates. I recommend you Dontaku’s local sashimi plates. I also recommend the pork as a good cooking ingredient. The pork which was purchased at a shop with a triangle roof located at the big street which has a prefectural office was very delicious. I purchased it last time and this time again.